Punjab state is located in the northwest region of India. This state has been divided into Majha, Doaba and Malwa regions. It is bordered by Jammu & Kashmir, Haryana, Himachal Pradesh & Rajasthan states. Chandigarh is the capital city of this state. Punjab has several institutions of higher education which provides UG, PG & other courses in different fields. As per the census 2011, the average literacy rate of Pubjab is 75.84 %. 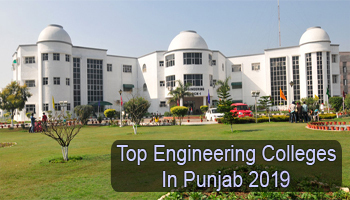 Here we are providing a list of Top Engineering Colleges in Punjab 2019. Here at Sarvgyan.com, we are providing a list of top engineering colleges in Punjab. In this list, we have included various institutions like IIT’s, NIT’s, & various government /private universities. These colleges offer engineering courses in various specializations. Here we have rated the colleges and institutions on the basis of various factors such as national importance, college affiliation, approval, infrastructure & facilities provided by colleges, quality education, placement records, etc. For admission in B.Tech programmes, students can apply through national level examination (JEE Main). Students can also appear in the LPU NEST examination to get admission in LPU and its affiliated colleges. For admission in IIT, students have to qualify both (JEE Main & JEE Advanced) exams. Candidates have to qualify the GATE examination for admissions in PG engineering courses (M.Tech). Various government and private engineering colleges of Punjab offers courses in various specializations. Some top specializations are Electrical Engineering, Mechanical Engineering, Civil Engineering, Computer Science & Engineering, Electronics and Communication Engineering, etc. For any other queries about Top Engineering Colleges in Punjab 2019, you may leave your queries below.